A staggeringly quick graphics card with an unbeatable price tag. It may still get pretty toasty but its quieter than the 290X and performs just as well. Almost two weeks after AMD released their Radeon R9 290X they've taken a scalpel to the Hawaii XT GPU and produced this ever-so-slightly cut down version, called the AMD Radeon R9 290. First off though, an apology. Sorry if any of you guys went out and bought an R9 290X after our review of AMD's latest top-end graphics card. You were, unfortunately, victims of a graphics card price war between AMD and Nvidia. At the time it was released it was a fantastic card, offering incredible performance compared with both the GTX Titan and GTX 780 but for a good deal less than they were retailing for. Because of that, with a few caveats about heat and noise, the R9 290X got a glowing recommendation from yours truly and an Editor's Choice award. Then the inevitable happened. Nvidia hit back, announced their own GeForce GTX 780 Ti , due to be released in early November, and slashed the prices on their standard GTX 780 and GTX 770 cards . 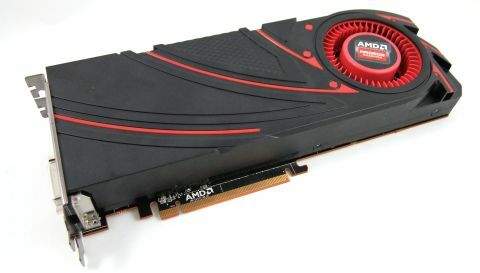 Dropping the GTX 780 to around £400 / $500, or below, meant AMD had to follow suit with this R9 290. And so we've got a new graphics card, based on AMD's top graphics silicon, for just £320 / $400. So, the new 290 is over £100 / $150 cheaper than the 290X and it must surely follow that it's had a hefty chunk of the silicon removed too, right? All you're really missing is the 'X', some 256 Radeon cores and 16 texture units. You're still getting the full 4GB GDDR5 frame buffer, 64 ROPs and that hefty 512-bit memory bus. All that means in performance terms is the straight 290 is generally less than 10% slower compared with the 290X. Most of the time it's between 5-8% slower, with just my GRID 2 benchmarks actually stretching into double figures percentage-wise. In actual FPS terms all that translates to is a couple frames per second difference, at best. If you had two PCs side-by-side, one with a 290 and the other with a 290X, you genuinely wouldn't be able to see the difference between them. I'm pretty confident, because of general fluctuations in frame rate, that even if you had the FRAPS FPS counter up in the corner of the screens you'd still struggle to tell which was the faster card. While you may not be able to see the difference though, you might be able to hear i . The straight 290 had a little driver tweak just before launch - possibly due to the reaction to the 290X's noise levels - which limited the fan speed to 47%. Keeping it below the 290X's 55% max fan speed does little to harm the performance but makes it noticeably quieter. It's still nowhere near the same aural performance as the Titan-esque chrome cooler on Nvidia's top-end cards, but it's a definite improvement over the noise levels of the 290X. In essence then the Radeon R9 290 is an absolute blazing graphics card. £320 / $400 is about right for a top-end, performance graphics card. Unless you really need the double precision performance of the GTX Titan for your professional graphics applications, there's simply no need to spend a penny more. It does mean though that the Radeon R9 290X is now essentially irrelevant. It's not noticeably faster, runs hotter and makes a hell of a racket in comparison with the straight 290. There must be a good deal of buyer's remorse happening right now for the poor folk that pre-ordered the 290X. Sure they can talk about how it's the 'real' top card, but anyone with an R9 290 can be quietly smug they got the better deal with the same levels of performance. But what of Nvidia's GTX 780 Ti response? Well, we can essentially ignore it when we're talking about £320 / $400 graphics cards. Nvidia have already announced it's going to be priced around the $699 mark, so no matter how much extra they can get out of the GK110 silicon it's going to struggle to justify gamers shelling out the extra $300 over the 290 for it. The GeForce GTX 780 Ti may well end up as the fastest graphics card around, but with the Radeon R9 290 performing like this - for almost half the price - that just might not matter. The synthetic performance shown by the Heaven 4.0 benchmark holds up Nvidia's claim the GTX Titan has the highest raw performance metrics of all the top graphics cards, but if that's not being utilised by the latest game engines that's almost meaningless to us gamers. The actual gaming benchmarks show the straight R9 290 being more than a match for all the top cards around today and all for a bargain price tag.